Now that the Oversteer Nissan GT-R is available it’s time to put it against the Tomytec version. Note that they are not exactly the same models. 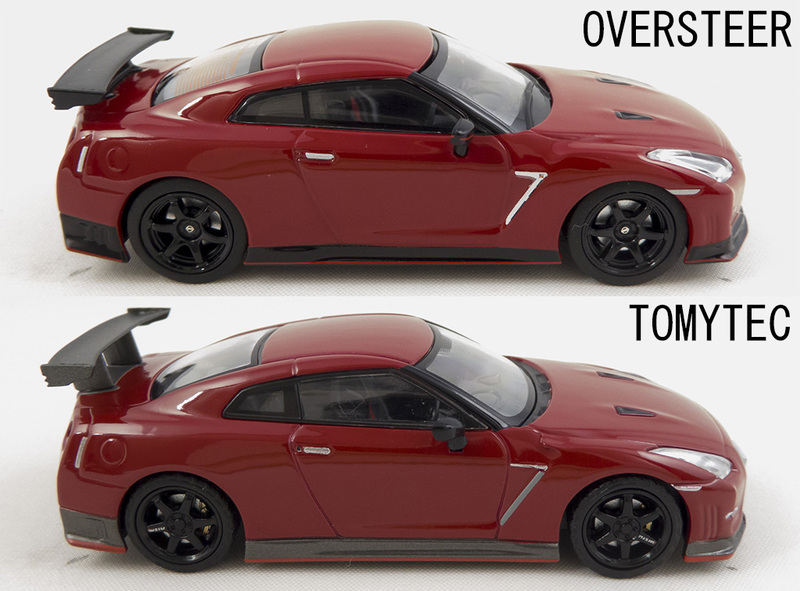 Oversteer is a 2014 edition while the Tomytec is a 2013 N-Attack Package edition, and both being very accurate to their real counterparts you will see differences in bodywork. Two completely different styles of packaging. Oversteer’s signature bright green box with large acrylic display case and base is certainly more appealing than the sober Tomytec packaging. Both are very well made for such a small scale. The N-Attack version by Tomytec has a lower stance and higher rear wing as it should. Now this is where Oversteer excels and put a lot of efforts into. 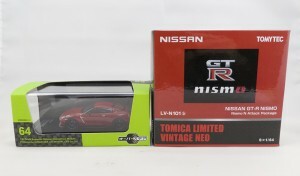 But Tomytec’s GT-R is one of their finest model. On a close inspection the main difference is decals versus photo-etched parts for the emblems. Tomytec’s decals are sharp but look dull compared to the photo-etched emblems Oversteer uses. The drawback with photo-etched parts is that they seem to be very difficult to apply properly and can be slightly crooked on some models. The wheels are similar in construction with rubber tires but Tomytec’GT-R are better looking thanks to the visible brake calipers. 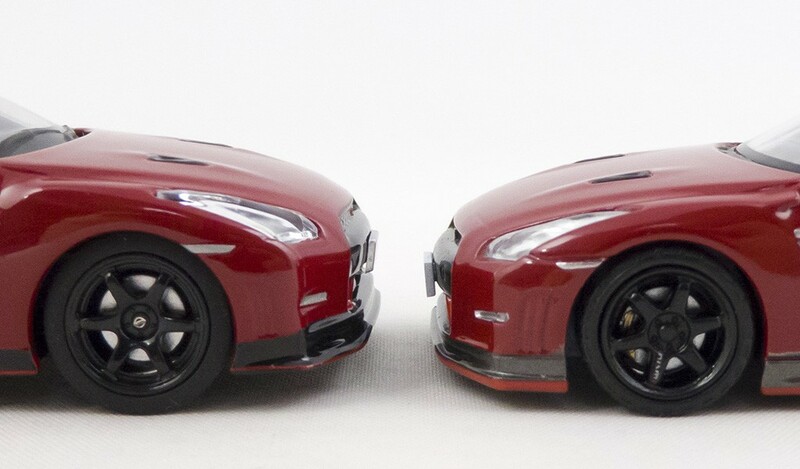 The front lights are better made on the Oversteer version, the plastic used is clearer and the sculpt more detailed. They also put a bit of orange paint to mark the signal light. The windshield wipers are inexplicably missing on the Tomytec. Finally, Oversteer put chrome stickers on the side mirrors, and that looks way better. The defogger conductors are a very nice addition on the rear window of the Oversteer, but are opaque. It would have been perfect if slightly transparent. 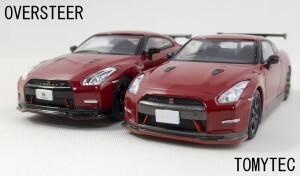 The fact that Oversteer’s GT-R is slightly cheaper than Tomytec’s is worth mentionning. And it comes with a nice acrylic case as a bonus. Hard to chose a winner in this comparison, both makers are delivering the most advanced and accurate models at this scale. 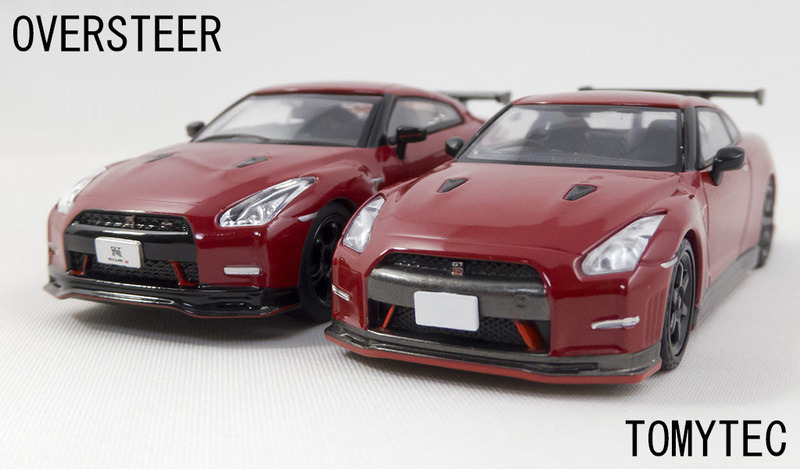 No matter which one you get you will be blown away by the quality of these tiny cars. 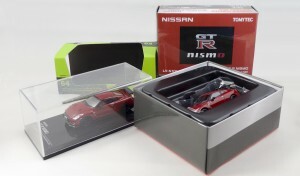 That said, Oversteer puts more attention to micro-details than any other maker and it shows once more on this GT-R.